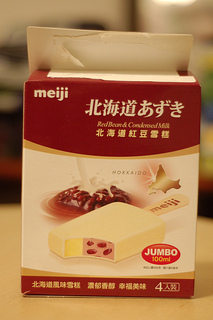 Last time I stopped by the neighborhood Asian grocery store I picked up Wakakusa Daifuku (a japanese sweet which was the subject of my last report), and my wife picked the product which I’ll highlight this time – Meiji’s Hokkaido Azuki ice cream bar. Meiji is a major producer of various food items – sweets, milk, juices, and soups to name a few. For those history buffs, ‘Meiji’ also represents an era in Japan from September 1868 through July 1912, where Japan’s society evolved from feudalism to a more modern structure. Hokkaido is Japan’s second largest island, situated in the north, and it’s actually depicted on the package. I discovered that Azuki beans are in fact produced there, but I haven’t been able to verify if those used in this product are officially Hokkaido Azuki beans. 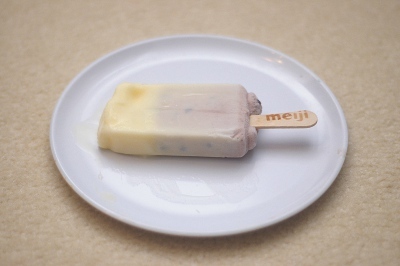 This ice cream bar has a azuki bean core surrounded by a milk coating, painted on very thin except near the tip where there is nearly an inch of solid coating. My sweet-tooth instincts compelled me to bite here first, and I was rewarded handsomely with a lusciously thick, creamy flavor, sweet but not overly so. The tip’s shape was deformed, likely a result of partial melting and re-freezing, but I got over this quirk immediately. I’ve attached a picture at the bottom of this article. In the core, beans have been used in both whole bean and paste form. Unlike some azuki-based deserts which are overloaded by sugar, this one has a very mild sweetness which doesn’t overpower the strong, earthy azuki bean flavor. The rough texture here strikes an excellent balance with the outer coating’s creaminess. I was impressed by the surprising number of beans packed in, similar to the picture on the box. Personally I’m not very found of ice cream bars where a wooden stick, serving as a handle, is submerged partway through. The first few bites are great, but as I get closer to the stick I have to bite carefully which takes away from the enjoyment. Neither the texture nor the flavor of wood fits with ice cream so accidental bites are unpleasant indeed. Each box contains four bars, and each bar is 100g (1 serving). There isn’t a great deal of nutrition in this bar, with protein and fiber only 2 grams and 1 grams, respectively. There is also no trace of common vitamins such as A and C.
What really shines about this product is two of the most important nutrition metrics (to me, at least): calories and sugar content. In a single serving there is an below average amount of calories per serving size – only 173. But what’s even more amazing is the sugar content – only 5 grams! That’s the lowest I have seen in a product of this type and as a seeker of low-sugar sweets it really impresses me. I’m confounded on how they managed to create such a sweet flavor from only 5 grams of sugar, especially in the sugary milk coating. One of the secrets of creating a low calorie, low sugar desert is to use water as a base, and that is done here with water as the most prevalent ingredient. Many of the top few ingredients are healthy and natural – milk powder, red beans, and coconut oil. Maltose, a sugar produced from grain and known by the name ‘malt sugar’, is used in higher proportion than normal sugar. As you get to the less prevalent ingredients you start to run into “Natural Flavors” as well three artificial food colorings. These are disliked by the many of the health conscious, and for good reason. As an example, the blue coloring used is made from petroleum and is one of the dyes suspected of causing cancer (see link in references below for more info). Though legal in most countries, in the past it had been banned in over 10 countries. As a health skeptic, I’m more likely to believe that companies lobbied to get this legalized as opposed to researchers suddenly “discovering” they were not bad for health. Besides the health angle, I think the colors themselves are a bit strange (as well as quite different from those used on the package), and would like to see how things look without any colorings. I’m sure it would still be appetizing and much better for the body. I purchased this at a local asian grocery store for around $3. I plan to verify the exact price next time I stop by there and update this blog. A superb mix of azuki beans and sweet milk, made with mostly natural ingredients and very low sugar. The main drawback is the presence of unknown natural flavors and the dreaded artificial food colorings. 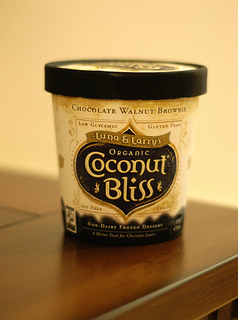 For my first review I’ve decided on a frozen dessert which is one of my recent favorites. This is something that I’ve savored several times in the last month and plan to continue on doing for the foreseeable future. When I think back on the ice cream I used to eat in high school and compare that to what I have been enjoying the last few years, its amazing how different they are – especially regarding the ingredients used. But this is only a natural consequence of putting more consideration into what I eat. For ice cream I typically use three types of information when deciding on the healthiness of the product: calories, sugar, and the ingredients themselves, as well as a few others which I give less weight to (protein, container size, etc.). Though everyone has their own opinions on what is really ‘healthy’, I subscribe to the theory that generally ‘natural is better’. Enough of the historical aside. Let’s move on to the juiciest, most mouthwatering part of any of my reviews, the discussion of flavor. First of all, I’d like to give a heads up to all the ice cream addicts who have eaten only milk-based ice cream (like me until recently). This is unabashedly a coconut milk based product, with some other important ingredients I’ll talk about in the ingredients section below. So of course there will be differences between this and dairy-based ice creams. For those willing to take a step out of their limited world of dairy ice cream, a little open mindedness will go along way to quickly accustoming to these differences. One of the key differences is the texture when frozen. When compared to standard ice cream it seems finer and crumbles/flakes quite easily. But once it is in a half-melted state, the creaminess factor goes up a notch, though not quite reaching that of milk-based creams. All things being considered, the creaminess and overall mouthfeel of the base, crafted by a delicate balance of coconut, water, and guar gum, is quite impressive. But the real killer here is the flavor – a deep, complex taste that lingers on the palate long afterwards. The base cream, it’s richness derived from a good helping of cocoa, is complimented nicely by a generous helping of crunchy walnuts and sweet chocolate brownie chunks. I can’t put it any better than the marketing quip on the front of the package: “A Devine Treat for Chocolate Lovers“. The only issue I have with the flavor is that there is a mild chalky aftertaste. Its the same I get after eating walnuts by themselves, which marks them as the culprit here. Their crunchy contribution to the overall texture is nice but I wouldn’t mind sampling a version of this product without the nuts. This dessert does an excellent job of satisfying those choosy about ingredient quality. Most ingredients are organic, with a subset declared as Fair Trade. Apart from the walnuts and the brownie morsels, the base is made from only six ingredients. There are other products on the market with less ingredients (ex: Haagen-Dazs “Five”), but their ingredients are generally not Organic nor this rich. It is vegan friendly with no dairy, soy, or gluten, so the number of people who can safely enjoy this ice cream goes far above any typical milk-based cream. The ingredients are also very natural, with no artificial flavors or colorings. Thankfully, my personal pet-peeve “natural flavors” is not present either. “Natural flavors” is a general category for any flavoring which is derived from natural (animal or plant) sources. “natural” is great and all, but I’m turned off by the lack of details about what was used (could be tree bark for all you know) and that it may be heavily processed. I avoid products with this usually, though if the taste is right I can make an exception. The sweeteners employed are both natural and well known – agave syrup and coconut sugar. The debate on which sugars are truly healthier is far from settled but I think it’s safe to have a mixed diet of typical powdered white sugar and other variations like these which are more natural with less processing. The Vanilla extract used is also natural, with no artificial “Vanillin” used. Calories (per 95 g serving, ¼ of container) are 250, par for the course here. Sugar is 15 g per serving and happens to be one of the reasons I decided to try this out. Compared to other products which can have approximately twice the sugar, this is surprisingly low, especially considering the rich flavor. This can be attributed to the fact agave syrup has a higher sweetness per gram than normal table sugar. Agave syrup is generally valued for its relatively low glycemic index, and less processing compared to some artificial sweeteners. As with most ice creams salt content is low (2% of recommended daily intake). A nice bonus is a per-serving iron amount of 15% of daily intake, compared to a much lower percentage in many other products (many have 0%). Price is $6.49 with tax (bought around 9/15/13). This a bit pricey for those on a budget, but not unexpected, considering this is a non-dairy specialty product. There a only a few places that I know of in South Florida that sell this, one is Whole Foods Market which is where I picked it up. Great organic coconut ice cream with an excellent taste, average calorie count, but less sugar content than many other similar products. Not cheap but an exotic item definitely worth trying.